Missed posting on Monday. I will make it up, me swears. This comic shows the benefits of magic brownies… you should make one about the consequences of magic brownies… you know; Rabid Squirrels jumping out of your pants! Hey!! Those aren’t the magic brownies I was thinking of! I like magic fungi, but I sure wish it was fungirl, instead. are you ever going to post a new update? I’d be more concerned about the magic brownies the rabbit left in his hat! Cute…..Bunny. HA! never needed brownies, ruins the flavor! 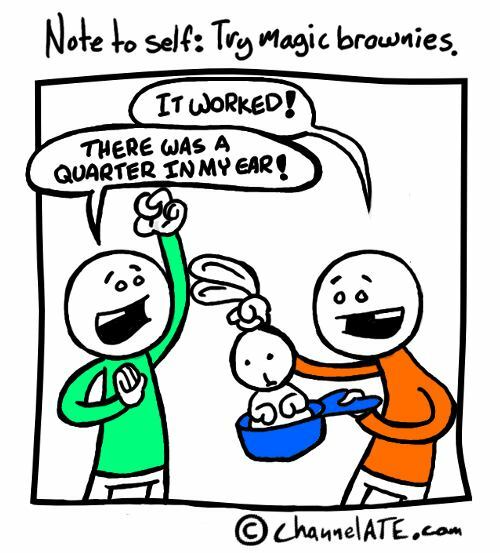 Did you eat too many ‘magic’ brownies and forget to write more strips (while giggling at the nothing in particular)? thoroughly enjoying reading all your strips, cheers! It’s difficult to find knowledgeable people on this field, however , you sound like you know what you’re writing about! Cheers! Thanks for your sharing, it helps me a lot. This is your best Ways To Make Money Online yet! This is why I recommend your site. Searching Magic Brownies on Google Image Search has this comic as the first result, then it’s usually Ben and Jerry’s. Hi there to every single one, it’s genuinely a fastidious for me to go to see this site, it consists of helpful Information. TPnMoy wonderful points altogether, you simply won a logo new reader. What may you recommend about your publish that you made a few days in the past? Any certain?